1. In small bowl, whisk together 2 tablespoons milk and flour. In small saucepan, heat remaining milk over medium-high heat 3 minutes or just until simmering. Slowly pour in milk-flour mixture while whisking constantly. Cook 2 minutes, whisking constantly. Reduce heat to low and gradually whisk in cheese until completely melted. Remove from heat and stir in 1/8 teaspoon salt, mustard and white pepper; keep warm. 2. Heat oil in large skillet over medium-high heat. Add spinach and cook 2 minutes or until wilted, stirring frequently. Stir in 1/8 teaspoon salt; keep warm. 3. To large skillet with 2-inch-high sides, add water to fill halfway, remaining 1/4 teaspoon salt and vinegar, and bring to a boil. Carefully crack eggs, 1 at a time, into small cup. Slowly slide eggs into water while immersing cup slightly in water. Cover tightly with lid and remove from heat. Let stand 3 to 4 minutes, or until egg white is cooked through and yolk is slightly soft. 4. Place 1 muffin half on 4 individual serving plates and top each with 2 tomato slices and 1/4 of the spinach. 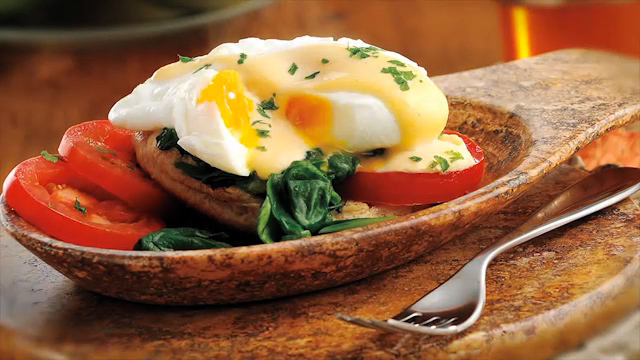 With slotted spoon, remove eggs from skillet and place 1 egg over spinach on each muffin half. Top eggs with sauce and serve with additional tomato slices garnished with parsley.